The radar... it appears to be... jammed. 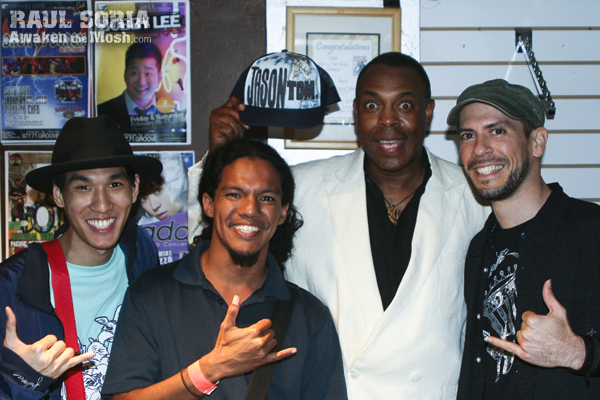 12.30.09 I got a chance to check out "the Man of 10000 Sound Effects" Michael Winslow at Pipeline Cafe. Well known from his Police Academy fame and those epic 2 minutes in Spaceballs, he had me laughing so hard I had trouble aiming my camera. That says a lot. The night started with my bud, Jason Tom tearing up the stage with his beatbox skills getting the audience primed and ready for the insanity ahead. If you could see the look on the audience's faces when Winslow took the reigns you'd see that people were being transported back to simpler days of comedy. How old were you when you first saw officer Larvelle Jones fight the bad guys or telling Dark Helmet that the radar had the bleeps, the sweeps and the creeps. Yeah people of all ages at Pipeline Cafe were as giddy as school children the whole night. And I was witnessing a vocal god. I honestly didn't know what to expect, perhaps some cool sound effects and relived memories. Michael Winslow's comedy act was top notch. He hasn't gotten slow with age and honestly I'd probably be a bit frightened if I ran into him at a mall, After his hilarious display of how he used to"scare crackheads by making clothes talk, or messing with Home Depot employees by making tools sound like they're on when their unplugged" I would not like to ring up this man's items at a grocery store. Utterly awesome. He did some unique impressions too, pulling off not just Robert Plant screaming those high notes but also Jimmy Page's guitar, just before performing a scene in Star Wars entirely on his own! He ended the night by pulling off an impeccable impression of Louis Armstrong singing "Its a Wonderful World" complete with his alter ego "Kenny G on saxaphone!"